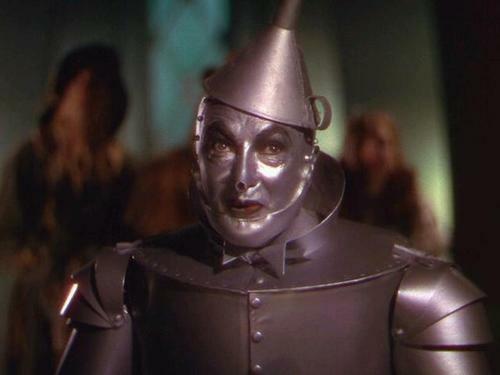 This post’s title is one of my favorite Tony Horton quotes from P90X, and has very little to do with our run this morning except that we did see a Tin Man hanging from a tree (more on this in a bit), and we did talk about Tony Horton quotes (though not this one). I was actually surprised at how good I felt, especially after the first 3 miles. At no time did the pace feel fast or forced. It just felt comfortable throughout. My shin continues to improve, and only felt like a slight twinge this morning. We completed the route in 60:57, which is almost 6-minutes faster than two weeks ago (though that was a Hattori run, and this was not). Our final total was 7.44-miles completed at 8:12 average pace per mile. As for the “Tin Man,” during our second mile I looked over and noticed about a 3-foot tall tin man hanging from someone’s tree that was made entirely out of old cans. I’m guessing that it was a bird feeder, but looked kinda strange. Anyway, it was another good run with Nathan in the books! Even though my right shin has been doing better than last week, I’ve been trying to be as cautious as possible. To that end, Nathan and I did today’s scheduled 40-minute, easy paced, run on the grass surface at the Steeplechase course in Percy Warner Park. 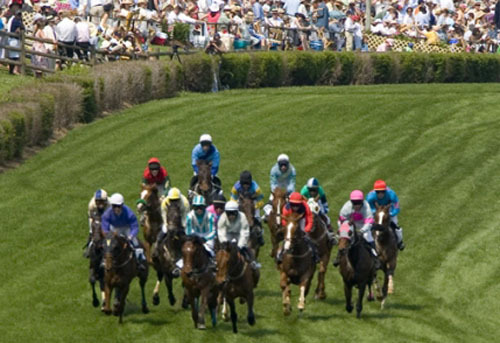 This course is a great surface for running and is the site of the annual Iroquois Steeplechase equestrian race, which is one of the oldest and most prestigious steeplechases in the country. The ground is very soft and consistent, with no rocks, roots, or holes. The only downside is that the grass is EXTREMELY thick, which forces you to work a bit harder than on the road. Overall the run felt great, though we did have to deal with very humid conditions and soggy turf (from the dew). By the end of the run my shoes and socks were completely soaked through, but my Dry Max socks again kept me from getting any blisters. In total we ran just under 4.5-miles during our 40 minutes, with a pace right around 9:00 average per mile. At the end we did 6 x 100m stride outs on the grass, which felt a little strange in high grass with wet shoes. Our final total with strides was 4.81-miles completed at a 8:51 average pace per mile. Quest for Boston – Deer, and Woodpeckers, and Hawks, OH MY! Due to my work schedule this morning, Nathan and I started the workout from the Edwin Warner Park Nature Center just before 5am, when it was still quite dark. About 10 minutes into our initial warmup, Nathan was telling me about finding a Brown Recluse spider in their house last Friday. I was listening to him, looking slightly down, but looked up just in time to see a deer standing a few feet in front of me on the road. It startled me enough to cause me to jump the side, which in turn caused the deer to jump in the opposite direction into the deep grass. There was another deer immediately behind that also ran away quickly when I jumped. That is the second time when running in Edwin Warner that I almost ran head-on into a deer (This one was a doe….the other time is was a many-point buck). Anyway, we completed the 30 minute warmup through the park with a total of 3.43-miles completed at a leisurely 8:47 average pace. For the tempo intervals, we ran out and back on the Harpeth River Greenway, and things went very well. 7:00 min pace felt extremely comfortable and controlled. 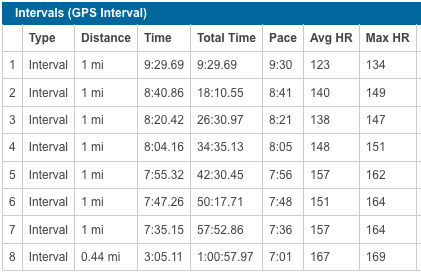 My Garmin “average pace” indicator did some weird things as we ran in and out of tree cover, but according to the distance reading we were very consistent between sets with .72, .71, .72, .72, and .72-miles completed. In total we completed 3.59-miles in 25:06 for an average pace of 6:59.6. During the tempo intervals (and again during the cool down) we heard a couple of woodpeckers that sounded like machine guns going off. I was again reminded of my running friend Susan who always says that she hears at least one woodpecker on every run. 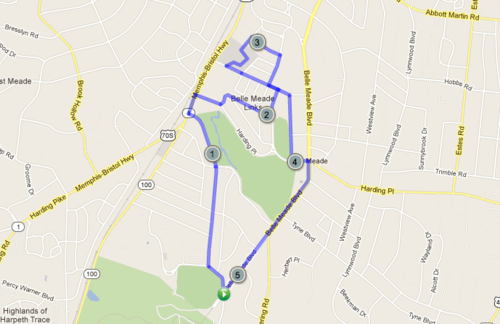 For our final, 30-minute cool down section we ran back in Edwin Warner Park on a reverse route to our 30-minute warmup. We were running through a short section right beside the Little Harpeth River, when I noticed a majestic looking hawk (I’m guessing red tailed) standing on the ground beside the path. We will occasionally see owls sitting in trees in the park, but I don’t ever recall seeing a hawk that wasn’t in flight. 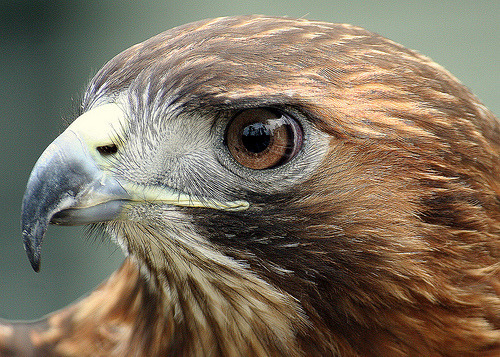 What a beautiful, beautiful creature! We finished our run back at the Nature Center after adding another 3.5-miles at 8:36 average pace during our 30-minute cool down. Since our pace was a bit quicker than the warmup, we ended up doing a very short section on the blue trail to add a few minutes to our time. In total we finished 10.51-miles for the morning at an 8:07 average pace with warmup and cool down. Another good morning! Beginning in the middle of last year I stepped up to running 6-days a week, with Sunday off. 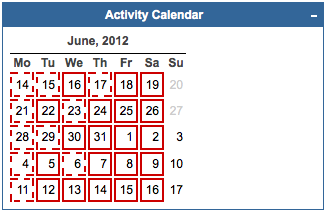 Following this same pattern with John as my coach, I have not missed a scheduled run for the past five weeks (red boxes are running days / dashed boxes are where I had 2 or more activities on the same day). 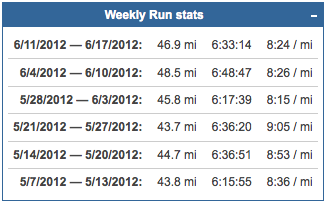 I’ve had bigger mileage weeks in the past, but never have I had 6 consecutive weeks with 43+ miles completed. I think there are at least three reasons for this improved consistency in my running: (1) Having a coach who monitors my logs brings a higher level of accountability. (2) I’ve been running a lot recently with Nathan, and it is always easier for me to get out and run when I’ve got somebody to go with me. Also, having a group to run with on Thursday nights and Saturday mornings is awesome. (3) I’ve been injury and illness free. All-in-all I’m very blessed to be able to run, to enjoy it, to have friends to share it with, and to have a family that supports me. This morning I just couldn’t get myself out of bed early enough to get my run in. Nathan is out of town for the weekend, and sometimes it’s really hard for me to get up and get going when I know that no one is going to be waiting on me. I owe a lot to Nathan and Paxton for my running improvement/success over the past two years. So, as punishment for my lack of morning motivation, I ended up running in the late afternoon when the temperatures were right at 90 degrees (nasty). My schedule called for 30 to 40 minutes at easy pace with 6 x 100m stride outs at the end. I started my run at the Edwin Warner Nature Center, and for two reasons did the first and last mile on the flat part of the blue trail instead of the road: (1) It always feels cooler on the trails with all of the tree cover (2) I’ve been feeling a bit of soreness in my right shin over the past couple of days and wanted a slightly softer surface for my easy run. After a first mile around 9:00, I settled into a very nice 8:30ish pace for the remainder of the run, and felt pretty good considering the heat. I completed my stride outs in the parking lot of the nature center (in full sun) with a pace a little below 6:00. Final total was 4.86-miles in 40:36 with an 8:22 average pace per mile. 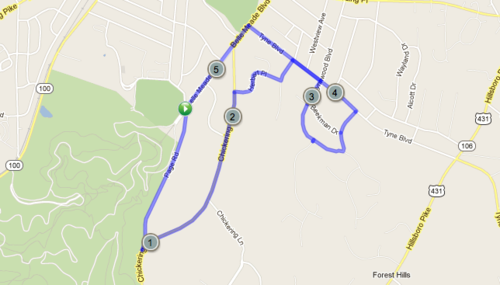 Today’s planned group run was the 11.2-mile main drive loop in Percy Warner Park, which is quite challenging. Since my schedule called for 14 to 16 miles total I got there a little early and completed just over three miles in Belle Meade before joining the group in the park. I mentioned on Friday that I had been feeling some soreness in right shin (shin splints), so this morning I decided to run in my old clunky and cushy Nike Vomeros since we would be doing so many hills in the park. This turned out to be a good decision and my leg felt pretty good. However, for the record, I now hate how these shoes feel compared to my Saucony Kinvaras. Gotta be diligent in my leg exercises so I can get out of these things as soon as possible on hilly runs. Even though the humidity was very high this morning after rains last night, I felt fantastic throughout the run today. I pushed pretty hard up most of the hills, even the daunting, named ones like 3-mile-hill, 7-mile-hill, and 9-mile hill (miles 6, 10, and 12 on the chart above). This was very encouraging after my miserable trail run earlier in the week in the same park. When we came to end Dan and the group had counted 21 total hills in the park (very unscientific), which is pretty good in only 11.2-miles. For my entire route (including warmup miles) this equated to over 2,000 ft of cumulative elevation gain. My final total was 14.29-miles completed with an 8:48 average pace per mile. Thursday night means track workout with the JSRC. Tonight was the second of our three week stint at the Harpeth Hall while the Nashville Strider’s Track Series is being held at Vanderbilt. After having great weather last Thursday evening, the heat was back tonight with temps around 90 degrees at the start. With the heat I was nervous about how I would feel considering I’ve already had one bad run this week. Also, my calves were REALLY sore from my Hattori run yesterday. I didn’t run any more mileage in my Hattoris than usual, but my pace was a bit quicker than I normally do in them. While I did notice a slight slowdown in my pace from last week due to the heat, I otherwise felt fantastic! Don’t get me wrong, it was very hot, but for some reason the heat did not seem to get to me tonight (though I did drink 64 ounces of fluid during the workout). The only issue I had at all was that my form felt a little sloppy in the curves during the first set of 4 x 200m. This got much better as we went along, so I’m guessing it had a lot to do with my sore calves. Overall I was very pleased with the consistency of my splits. The two sets of “fresh” 400m repeats were 44, 44, 45, 43 and 43, 42, 42, 42, and my two 600m “good” intervals were 2:08 and 2:07. My final total with warmup and cool down was 7.39-miles completed at a 7:43 average pace. I ended up with early-morning work meetings today, so I decided to just decided delay my run until the afternoon. I guess I could have started at 5:00am but knew this would not be smart based on how things went yesterday. My run yesterday morning was less than stellar, and for some reason I just felt tired all day. With this in mind, I didn’t want to compound my fatigue by having to get up super-early. The only good thing about today was that it gave my body a little more time to rest, and I could really tell the difference from yesterday. My schedule called for 60 minutes at easy pace, and I decided to make this a Hattori run through the streets of Bellevue. Even though it was hot, I knew immediately that things would be better than yesterday. My legs felt pretty fresh, and the aches and stiffness I felt on the trails yesterday were mostly gone. After a first mile of 9:02, I settled into a very comfortable rhythm in the low 8:00s (and even one 7:58) for the remainder of the run. As I was finishing mile two on Sawyer Brown Road, I saw an older gentleman riding a bicycle headed my way. I gave him a courtesy wave just as we were about to pass, and then he yelled “Wanna Run Together Sometime?” I had never laid eyes on this man before and was a little taken back by this question. Stammering for an answer I blurted out “maybe” and just kept running. I turned my head briefly and saw that he also kept riding. No idea what that was about. Anyway, for 60-minutes I completed 7.29-miles at an average pace of 8:15 per mile. On a side note, I have now put 240 miles on my Saucony Hattoris. Since the Hattori has a mostly foam outsole (as opposed to rubber), I really thought it would wear down very quickly. The irony is that today my big toe finally wore a hole in the sock-like upper, but the outsole is still going strong. The hole in the upper is fairly uncomfortable, so I guess this means it is time for a replacement. I’m really curious about the new Hattori LC (with laces), but these do not come out for another three weeks. Not sure how many more miles I can get out of my current pair before they become unwearable. Some days you’ve got it….some days you don’t. Today was clearly one of those days where I did NOT have it. However, I’m not down about it all, because before this I’ve had the longest string of days where I DID have it in my running life. The schedule for this morning called for 45-minutes easy with 6 x 100m stride outs at the end. Nathan and I decided to meet at the Edwin Warner Nature Center and run 22 1/2 minutes out-and-back on the Candy Cane and Red Trails between Edwin and Percy Warner Parks. I could tell from the outset that my body was just not going to cooperate. The humidity was still very high and my legs felt heavy and achy. I spent the whole run trying to maintain pace with Nathan, especially going up the steep hills on the red trail (still had over 1,100 ft of elevation gain even though it was just a 45-minute run), but eventually just let him go. It didn’t help that three times during the run I had to stop and re-tie the laces on my Saucony Peregrines. I love these shoes, but the stock laces have got to be the worst ever included on a pair of trail shoes. I absolutely cannot keep them tied, even with double knots. Any of my trail-running friends out there have a recommendation for a good pair of replacement laces? Anyway, I started to feel slightly better on the way back to the Nature Center, but coming back was mostly downhill and much easier than going out. At the end of the trail portion my total was 4.5-miles completed at just under 10-minute pace. We finished up with stride outs in the parking lot of the Nature Center. Recently Nathan has been blowing by me on the strides, but today I was able to keep up with him through the first 3 reps. However, for the final 3, he again blew past me like I was sitting still. My average pace for the strides was 5:48. Final total was 4.9-miles completed at 9:40 average pace per mile. With the rainy weather moving through Middle Tennessee came the return of the nasty humidity this morning. This was probably the worst humidity I’ve run in since the 500 Festival Mini Marathon back in May. There was a slight variation to my normal Monday workout this morning. For the last three weeks it has been 70 minutes total with 20 minutes easy, 30 minutes at tempo pace, and 20 minutes easy. Today it was 60 minutes total with 20 minutes easy, 20 minutes at tempo pace, and 20 minutes easy, with 6 x 100m stride outs at the end. During the previous three weeks, my goal pace for the tempo portion has been 7:15, 7:15, and 7:10. Today that goal was was dropped to 7:00 flat, though it was 10 minutes shorter. There are two things funny about this… (1) We didn’t realize how sharp the downhills were when running it the “normal” way, and (2) Even with the climbs we still ran the loop faster than the previous weeks. For the 20 minute warmup we completed 2.45-miles at an 8:14 average pace, and by the time we got back to the church building I was already dripping with sweat. For the tempo portion we ran 10 minutes out-and-back on Old Natchez, Old Hillsboro Road, and Del Rio Pike. It is interesting to me how different my Garmin 405 is from Nathan’s 305. My watch showed that we ran the entire 20-minutes almost dead-on 7:00 pace, while Nathan’s showed that we ran both of the first two miles several seconds too fast. Anyway, the pace definitely felt faster than last week’s 7:10, especially with the humidity, but I felt pretty good throughout. I figured the humidity and faster pace would make my heart rate increase significantly during the tempo portion over the previous 3 weeks, but it wasn’t too bad. The first week my average heart rate was 164 for 30 minutes at 7:15 pace. The second week it was 160 for 30 minutes at 7:15 pace. Last week it was 158 for 30 minutes at 7:10 pace. Today it was 160 for 20 minutes at 7:00 pace. For our 20-minute cooldown, we ran another 10 minutes out-and-back in the opposite direction down Old Natchez. By the end of this section my legs were beginning to feel a bit heavy, but we still completed 2.41 miles with an average pace of 8:22. The last thing on the agenda was the 6 x 100m stride outs, and both of us knew these were gonna be tough on tired legs. Nathan suggested that we use this long, flat driveway beside the church building for the strides. It was definitely the perfect spot, with no traffic, but it did have a sign that said “Private Drive: No Trespassing!” With our experience at Ensworth High School at few weeks ago, I half expected a security guard in a Hummer to jump out and tell us to get lost. Needless to say that never happened, and the strides were indeed challenging on tired legs, but my average pace was around 5:45. However, Nathan repeatedly blew past me like I was standing still. Overall it was another good workout with Nathan. In total we finished 8.12-miles with a 7:43 average pace per mile. Quest for Boston – 3 x 5(ish) = 15 miles done! Since Dan and Marc were both out of town this weekend, the task of organizing the group’s Saturday run fell to me. My schedule called for 14-16 miles at an easy pace with a few miles at a slightly quicker pace in the middle of the run. With this in mind, my plan was to start at the Percy Warner Park main gates and complete three loops in Belle Meade of 4 to 5 miles each. The temperatures and humidity were expected to be higher than the past few days (which they were) so each loop ended back at the cars to allow everyone to grab some fluids. The plan was to run the first loop fairly easy, pick-up the pace slightly for the second loop, then do the final loop fairly easy again. We ended up with a bigger group than I was expecting, which was great. For the first loop we did a version of Ed’s famous “Zig Zag” loop in reverse, which had a total distance of just over 4.5-miles . 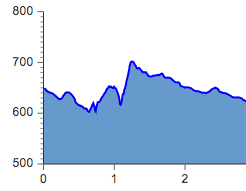 I ran most of this loop with Kelly and Aine, and we kept the pace very chill with splits of 9:17, 8:50, 8:46, and 8:40. Everything felt very comfortable. 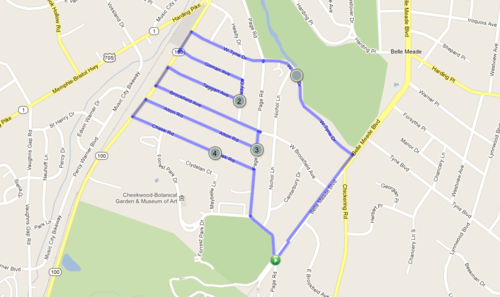 The second loop was just over 5.3-miles and was a little more challenging with regard to elevation change. My goal for this section was to drop the pace down around 8:00 min per mile, and again I was joined by Kelly for most of the route. We finished the fifth mile (started during the first loop) with a time of 8:22, and then reeled off splits of 7:59, 7:54, 8:19, 8:03, and 8:00. On the 8:19 mile, we ran backwards a couple of times so the following group would know where to turn, and this slowed us down a bit. Everything still felt very good, and I could have run faster, but I didn’t want to push anything today. Our final loop was a little more challenging than I expected when I drew it up earlier this week, but the visual interest of running through the Belle Meade Mansion and Temple properties made for a fun route. We took the pace back down a couple of notches, and I ran this one with both Bob and Kelly. Our splits were 9:02, 8:32, 8:45, 8:32, and 7:33. I got a little carried away on the last mile back on Belle Meade Boulevard. Even though I started feeling the increased heat and humidity during this section, my legs still felt fantastic, and I broke away a bit at the end. I just ran what felt comfortable, and was pretty surprised when 7:33 poped up on my watch. Normally at the end of a run I feel a rush of endorphins after I stop. Today I felt much worse after I stopped than when I was still running. Strange, but I think it had a lot to do with the increase in heat and humidity this morning. Overall, it was a fun run with lots of good conversation, and I felt pretty great throughout. My final total was just over 15 miles completed with an average pace of 8:27 per mile.